One of the more common and persistent algae problems. A Recurring Type Of Problematic, Resistant Algae. Optimizing water chemistry, improving pool circulation and eliminating phosphates!!! When the water chemistry is out of balance, the likelihood of algae growth increases and the growth of sanitizer-resistant strains, due to impaired sanitation, can be the result. A ColorQ, All-Digital Water Tester can perform all of the common pool water tests, eliminates the color-matching and guesswork. There is a model, for every pool testing need. Reliable water testing will help solve and avoid problems. Better Circulation helps make everything work more effectively. The Circulator is a return jet replacement fitting, that improves filtration, eliminates the dead zones that promote algae growth, improves sanitizer distribution and improves heat dispersion. Phosphates and Nitrates can increase the growth of algae and make treatment more difficult, as both are vital plant nutrients. Nitrate removal is not practical, but phosphate removal is easy enough to do. Adding Pool Refresh Total Trap will allow you to vacuum and filter out phosphates and should make algae control more effective. These 3 products all help improve the effectiveness of your sanitizer and reduce costs and improve the water quality. When algae is a frequent problem, it is the result of inadequate sanitation. as well as other factors. Maintaining proper sanitation is a must. Adding some backup sanitizing is important, as chlorine level rise and fall, based on pool usage and chemicals being added. Most pools use some sort of chlorine. A Salt Chlorine Generator is definitely a better way to do chlorine. 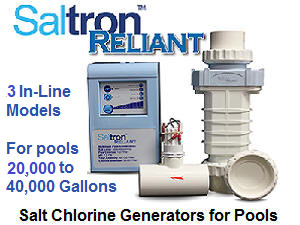 Salt chlorine generators are highly automated and give you better control. The salt level is about that found in human tears. In-Line and no-installation-required models are available. Adding a Solar-Powered Pool Mineralizer introduces copper and zinc ions, that provide algae control and additional backup sanitizing. This reduces the amount of chlorine required, to maintain an optimum level. A Solar UV Sanitizer creates "free radicals" which help destroy algae and other microbes and provides some sanitizing backup. It doesn't completely replace chlorine, but will provide better results and reduces chlorine usage. How to treat Yellow Mustard Algae, a resistant form of swimming pool algae? Mustard algae usually appears as a yellowish-greenish-brownish powdery deposit on the pool walls or bottom. It seems almost "pollen-like" and can be easily brushed off the walls. This troublesome algae will respond to treatment, however, it may require several steps to eliminate it completely. In many cases, a regimen of treatments is required to eliminate and control this sanitizer-resistant algae. The algae problem will frequently return, if the sanitizer level, water chemistry and pool water circulation are not properly maintained. The addition of a Nano-Stick Pool Clarifier can help the filter remove the dead algae and organic debris more quickly. In addition to proper sanitation, good circulation is a must to help prevent algae growth in areas with stagnant water or dead zones. The use of The Circulator, as a replacement for standard return jet fittings, can dramatically improve circulation, better distributing sanitizer to all areas of the pool. Adding a Dual-Ion Solar-Powered Pool Mineralizer will provide some backup algae control, especially important when chlorine or bromine levels bottom out. It can buy you some time, until the chlorine or bromine levels, can be replenished and restored to optimum conditions. Should problems arise, refer to the Pool Problems Page, as a source of problem-solving information, broken down into various categories. Scroll down the page and click on the linked keywords, catch phrases or images, in the archived answers below, to access additional information, on that topic or product. I am sure that I have mustard algae. It is a yellowish-green color and does brush off the walls easily. I can get rid of it by shocking heavily. A couple of weeks go by and there it is again. I have heard the copper algaecide will work, but I have a aggregate finished pool and would rather not use copper. Any other suggestions. Your description can be that of mustard algae. It can be treated with other than copper algaecides. You might have a two-fold problem. One part is that your sanitizer level, chlorine I assume, is probably not being maintained adequately at all times. Make sure that you maintain a 1-3 PPM level of Free Chlorine, at all times. Do this and it is unlikely that you will see the mustard algae return. If the problems starts in certain areas, redirect the return flow to improve the water flow, in that area. Adding a circulation booster, such as "The Pool Circulator", will improve the dispersal of chemicals and dramatically improve circulation. It's simple to install. For more information, please click here. One of the best products to use for mustard algae is one of those "Yellow" Products containing sodium bromide. Used in conjunction with a shock treatment, it will generate bromine, which seems to be especially effective against mustard algae. It's important to test for Free Chlorine, when shocking a pool. Make sure that you add enough product and it is added frequently enough to boost the Free Chlorine to 5-10 PPM. You want at least 1-3 PPM persisting through the over night period. Do that and there should a major reduction in the mustard algae, by the morning. Keep the filter operating continuously, until the problem is controlled. You didn't mention if you have a robotic pool cleaner. They are very effective at cleaning and improving the water circulation on the bottom and can help remove some of the powdery mustard algae. Improving circulation, in the corners, will help prevent a recurrence. If this website was helpful, in solving your problem, please consider joining our E-Letter Mailing List. You'll receive E-Letters, with helpful information, new product updates, suggestions and sale announcements. I hope that I have provided the solution. ► Coping With Mustard Algae? This is our second season in having a 20X40 inground vinyl liner pool. We are having extreme difficulty this year with mustard algae. We got mustard algae at the beginning of the season. Our pool professional recommended we use the particular copper algaecide because it had less copper than other products he carries. We treated the pool once and realized that the shock we were adding to the pool, was dissipating very quickly. Less than 24 hours later, it would test that it had no free chlorine. Our pool professional came by and tested for nitrates and found that we had nitrates in the pool. This problem was easily remedied by renting a submergible pump and pumping the pool down as far as possible (keeping the liner in place) twice. We again tested for nitrates and it said we had remedied this problem. We again were told to add the algaecide, which we did. They also told us to put in 4 lbs of shock. After 24 hours, we were told to vacuum to waste. Which we did. Within 24 hours the mustard algae was back, so we repeated the treatment. We were told to not add any more shock, as this might combine with the copper in the algaecide to discolor my liner. Again , I vacuumed to waste. After this treatment (the third one) on the mustard algae, I was still seeing the sand like material on the bottom of the pool. I thought I had not vacuumed to waste very good, and was told to go ahead and vacuum and add metal treatment (4 quarts) to remove the copper (it was at 0.6 PPM) Before adding the metal treatment , I once again vacuumed to waste and added the metal treatment. I went back today (24 hours later) and the copper was still at 0.6 PPM. I was still told not to add shock, even though my free chlorine is at 0.9. They gave me two more bottles of metal treatment and told me to have it tested again in 48 hours. I also am still seeing obvious signs of mustard algae. My question after all this is twofold 1. Why isn't my algaecide working, 2. What do you do about the copper. My pH tested today at 7.2. Please help. Let's say that you do have mustard algae! Just because your water tests positive for nitrates, doesn't mean that it is inevitable that you will have mustard algae problems. The testing for nitrates by dealers is not a common practice. Granted, the nitrates in the water is not a benefit, but it is not the end of the world, nor is it necessarily a reason to pump the pool out twice. You may not be able to remove nitrates, but you can remove phosphates, which is the next best thing. Like nitrates, it is a vital plant nutrient. POOL REFRESH makes it easy. The algaecide that you added is used to control mustard algae. If the product contained less copper, it was offset by requiring you to add more product. There is no benefit, so far as the copper dosage is concerned, if you followed the label. You can add all the metal treatment that you want and the copper reading will not decrease. The copper is in a chelated or stabilized state and it will remain in the water indefinitely. The addition of the metal treatment probably has diminished the effectiveness of the copper to deal with mustard algae. It seems apparent, in this instance, that copper has not worked, so let's try something else. Try using a sodium bromide product. It is sold under several different names - check the ingredient statement. Use this product in conjunction with a shock treatment. Make sure that you keep the Free Chlorine in the 5-10 PPM range for at least an overnight period. It may take more shock than you think to accomplish this goal. The longer you take to build up the Free Chlorine level - the longer the algae will continue to grow. Keep the filter operating and use the brush on the walls and bottom. A pH closer to 7.2 is a benefit during this period. This regimen should work quickly, if you keep the Free Chlorine level elevated. You don't have to do anything about the copper - certainly don't add any more metal treatment! Adding a dose of a Blue Clarifier will help remove the dead algae. After the water clears, backwash or clean the filter and resume normal pool operation. Clarifiers can interfere with some filter media. For that reason, you might consider adding a Nano-Stick Clarifier, which works 24/7 and does not add chemicals or affect filters. It is 21st century technology. The recurring nature, of the problem, could be indicative of dead zones and poor circulation. The Pool Circulator is a circulation booster insert, that dramatically eliminates dead zones and makes the water come alive. You'll get better distribution of sanitizers and that should help minimize algae and other related problems. I hope that I have been helpful. I service pools and have several that are painted ( both rubberized & epoxy ). In our summer heat, I notice much more problem with yellow algae in a painted pool compared to plaster. I keep the alkalinity higher in a painted surface but some chalking does exist with the heat and chemicals. Is there any explanation as to why these pools show yellow which seems to cling to the surface? Also, any suggestion as to a product that will help? Thank you very much. So far as I know there is no correlation between yellow-mustard algae and the type of pool or pool finish. It seems to be an equal opportunity problem, that appears when conditions are favorable. High pH will reduce the effectiveness of chlorine and could be associated with high TA. This problem is one of resistance to normal chlorine levels and even resistance to copper. The treatment that seems to be most effective is the addition of a sodium bromide product and shock treatment. This will convert the chlorine to bromine, which seems to be more effective in certain circumstances. For free chlorine testing, I suggest using one of the ColorQ Water Analyzers, as they reliably, provide the right kind of information. To confirm proper overall pool water chemistry, visit a pool store that has a very reliable, professional lab such as a WaterLink SpinTouch Lab, as opposed to a less accurate test kit or strip reader. I hope that this information will prove helpful. ► Questionable Use Of Copper Algaecide? My pool shop has given me a copper algaecide, as I have noticed a small area of mustard algae in one area of my pool. As part of my pool system I operate a mineral purifier. Am I correct in thinking that these are not compatible because the algaecide is copper based and should I use another product? That product is an appropriate and frequent choice for mustard algae. However, it was wrong to recommend it in your case. The particular mineral sanitizer system that you have contributes copper ions to the water, as part of the sanitizing process. Therefore, the mustard algae was already growing in the presence of copper ions and another type of treatment should have been suggested. It is not a compatibility issue. I suggest that you shock the pool and add an initial dose of a polymer algaecide, as this is chemically different and compatible. Another type of mustard algae treatment, based on sodium bromide, cannot be used, as it will shorten the life of your particular mineral sanitizer cell. Another possibility is that your mineral sanitizer cartridge is exhausted and is no longer contributing copper ions to the water. If that is the case, adding copper algaecide is appropriate can help jump-start the treatment. Solar-Powered Dual-Ion Mineralizers release copper and zinc and can be used in pools that contain bromine or bromides. BETTER CIRCULATION CAN SOLVE A HOST OF PROBLEMS. 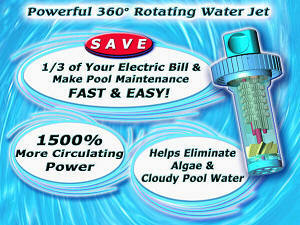 The Pool Circulator is the easiest way to improve circulation and eliminate the dead zones, that promote algae growth. I hope that this information proves helpful. Hi Alan, first of all I'd like to say, "great website." It's been helpful. My question is this. I have about 10 or so pools on my route that I have mustard algae problems with every year. I have found that sodium bromide treatment works wonders, but it is so expensive to try to dose 10-15 pools for the whole season. I had an idea to install in-line chlorinator's on these problem pools and run chlorine (liquid and tabs in the pool itself) while introducing 1" bromine tabs to the pool through the feeder. Would this achieve the same result? Why or why not would it work? Do you know where a person can purchase liquid sodium bromide from an alternate source? Thank you. Your intentions are two-fold. Obviously you want to continue doing what is needed to properly maintain these pools and, at the same, there are economic realities. You should never add bromine tablets to anything other than an approved brominator. I believe that your intent is to use bromine tablets to introduce bromine on a continuous basis. Ultimately, how much bromine can be present depends on the bromide content, as well as the chlorine level. Bromine tablets are a costly means of boosting the bromide reservoir. If you want the bromides to convert into bromine, use sodium bromide as the source. It is not a case of not working, just too expensive and is not likely to perform in the same manner as sodium bromide and a shock treatment. A gallon of sodium bromide solution has a content of about 4 pounds of sodium bromide, at maximum. The rest is water. Based on your costs, which is more economical? I have no information available on alternative sourcing. I suggest that you maintain a higher chlorine level during the most problematic times, as this is probably necessary, due to the fact the bromine formed is more susceptible to the Sun's UV rays, You may be able to get by with a single dose, of sodium bromide, as it does not leave the water, after conversion to bromine. LaMotte offers a Bromide Test Strip, that you can use to monitor the bromide level and know when more sodium bromide should be added. Make sure that the pH is 7.2-7.6, as higher values will decrease effectiveness. Stabilizer level is another factor to consider, as it serves little or no purpose, once bromides have been added. It does not help protect the bromine, from destruction, due to the Sun's UV rays. I hope that I have been helpful. I e-mailed this question to another web page and I have not heard back please help. Hi, my name is Darin. I have a 35,000 gal. vinyl liner, inground pool. I have a 300 lb. sand filter and an automatic chlorine feeder ( 3" stabilized trichlor tabs). My filter runs 12hrs. a day. This is the 7th summer I have had my pool. Up until now I have never had any real problems with my pool water chemistry. I have what I believe is Mustard Algae and I can't get rid of it. I maintain approx 3-5 ppm chlorine, 7.4 Ph, 180 TA. For 3 years I have been using a 4 in 1 Shock that does contain a stabilizer. As a result my cyanuric acid level is 240 ppm. I have been told by a few stores that almost any level over 40 is o.k. and not to worry about it, and that excessive stabilizer does not cause or promote the growth of algae. Is this true? On approx. Monday August 4th, 2003 we started to notice what looked like it might be sand on the bottom of the pool. It would lay in any depressions in the liner and on the steps, again it would lay in the depressions. We started to vacuum the pool daily only to find the next day it would look the same. At this point the algae would vacuum up very easy and would cloud up if you waved your hand near it. After several days of this I ruled out sand or any other foreign debris in the pool. On Friday August 8th, 2003 the pool got cloudy, whitish colored, and still produced the same amount of algae every 12 to 16 hrs. I shocked the pool with a 4 in 1 shock according to product label for heavy algae growth, 2lbs per 10,000 gal. I put 6lbs in 35,000 gal. This raised my chlorine level well above 10ppm. On Sunday August 10th I added 32oz. of a copper based algaecide and had the pool water tested. pH and TA were o.k. Calcium level was low, I adjusted to a proper level. Copper level was 0.2 ppm. Chlorine above 10ppm. The algae growth seemed to slow for a couple of days. We continued to brush and vacuum daily. I also cleaned and changed the sand in the filter. On Thursday August 14th the algae still seemed to be growing steadily. I was instructed, after testing my water( chlorine over 10ppm, stabilizer 240 ppm, everything else o.k.) to shock the pool with calcium based chlorine, circulate 1 hr. and add 2-32oz. bottles of copper algaecide. I shocked the pool and 45 min. later the power went out. We brushed the pool several times that night and the next morning. 9am the next morning the power was back on. I checked the chlorine level, above 10ppm, and added more copper algaecide. The calcium based shock made the pool very cloudy, this took several days to clear up. On Saturday August 16th the algae still seemed to be growing at the same rate. I called the dealer. They told me that because I didn't add the copper algaecide 1 hour after shocking that it wouldn't work and I needed to do it again. I shocked the pool again with a sodium based shock and added 2-32oz bottles of copper algaecide. At this point we are still vacuuming every day. And always the next day the algae is back. As this problem has progressed the algae has become more difficult to vacuum up and now grows on the front of the steps and is much more wide spread in the pool. I got in the pool with a mask to look at the algae. It still will cloud up and it feels slimy between your fingers. When then algae first starts to appear it looks yellow, like sand on bottom and like a film on the front of the steps. As the algae gets thicker on the bottom it seems to get a whitish cloud over it. And then after about 24 hrs it looks like sand again, only it looks brown. The pool store tells me that with my copper level at 1.0ppm and my chlorine level above 10 ppm that algae can't still be alive. That it must be dead and it is just to fine for my sand filter to filter out. They tell me to use a filter aid and vacuum algae to waste. Tuesday August 26th.. The pool is quite clear, however the water has a definite green cast to it. And after vacuuming to waste for 3 days and using a filter aid the algae still forms on the front of the steps like a yellow film. And collects on the bottom in all the depressions. It is now suggested that what may be in my pool is metals falling out of solution due to the fact that my chlorine level is above 10ppm and has been for 3 weeks. They are now suggesting that I neutralize the chlorine down to 5ppm and stain and scale inhibitor to remove the metals. Then after 48 hrs add filter aid to clear up pool. Please tell me if there could be another cause for this apparent algae growth. I'm not sure it is metals falling out of solution mainly because it does not feel gritty. It feels quite slimy. And it seems to grow in the exact same places and in the same shape every time. It also seems to grow evenly through out the shallow end out the pool regardless of the amount of circulation in that area. The only place that it seems not to grow is in the deep end, almost like there could be a thermal layer and the algae doesn't like the colder water. Thank you very much in advance for your time and advice. I truly hope you can provide some information on this issue. Interesting letter. The slimy feeling is positively due to algae or other microorganisms! Sand filters can fail to remove dead algae effectively! Your cyanuric is way too high and you need to replace water! The algae is probably resistant to normal levels of chlorine, as high cyanuric acid levels cause the chlorine to act as if the level is much lower, than the test shows. The slime could be bacterial and copper probably will not be effective! So where to you begin? First off, I suggest that you replace water in order to lower the cyanuric acid to below 100 PPM. This will help make the chlorine more effective and lower the concentration of copper and other metals. Once the water level is restored and the cyanuric acid level is below 100 PPM, shock the pool water and boost the Free Chlorine level to 10 PPM. At this point the chlorine should be more effective. DO NOT SHOCK WITH ANY PRODUCT CONTAINING A STABILIZED CHLORINE: using such a product will only speed up the rise in stabilizer levels. Use liquid chlorine, lithium or calcium hypochlorites, as shocking agents. Keep the pH close to 7.2 in order to make the more effective. Going forward, in order to avoid cyanuric acid buildup problems, you should consider switching to a salt chlorine generator. It will provide more control, better results and eliminate the buildup problems. Backwash the filter to waste and add 1/2 pound of DE to the skimmer with the filter running. This will help improve the filter efficien cy and make it better able to remove dead algae. Adding a dose of a blue clarifier the day after shocking is a good idea. It coagulates dead algae for easier removal. Instead of an ordinary clarifier, you might consider adding a Nano-Stick Clarifier. It is a 21st Century technology, that works 24/7 and can last up to 6 months. Make sure that the Free Chlorine/Bromine remains high, until the problem is solved. Redirect the returns to send more water towards the areas that are most affected. Adding a polymer algaecide, if necessary, might be another worthwhile step. Give the filter a day or so, with the elevated levels to make a difference. I hope that this all works out for you. You seem to have gone through the wringer. BETTER CIRCULATION CAN SOLVE A HOST OF PROBLEMS. You can instantly get better circulation and chemical distribution, with The Pool Circulator. Simple to install. Let me know how it turns out! How to get better control of yellow/mustard algae problems. Purifier/Mineralizer, uses copper and zinc ions. Treats 32,000 gallons. The Pool Circulator eliminates dead zones, improving sanitizer action. Easy installation. ColorQ Digital Water Analyzers eliminate all the color-matching and guesswork. Easy to use. ► Mustard Pool Algae Woes? I discovered your website last evening and you have an array of information. Thanks for helping to educate us. My situation is as follows: we had an in-ground pool built last February. The pool was installed with a salt chlorine generator and an automatic pool vacuum to make life easier for my husband and I. Since the completion of the pool, we have had a problem maintaining adequate chlorine levels. It comes in spurts. We are aware that after rain, we may have lower chlorine levels, but the inadequate levels are also there when there hasn't been a lot of rain. The other chemicals (pH, calcium, stabilizer, salt, etc.) are being maintained correctly. My husband checks the water weekly and brushes the pool and cleans the filter weekly. My husband has tried the approach of cleaning the generator's cell, but the pool still doesn't maintain adequate levels of chlorine. We are usually putting in chlorine on a bi-monthly basis. We even had a rep for the generator company come out and he informed us our chlorine generator is producing chlorine. The generator has consistently been on 100% boost. Due to the chlorine problem, we are continually battling an yellow-orange powdery residue on the walls and stairs of our pool. I believe it is mustard algae from lack of chlorine (when the readings are low). I also notice the stairs and bottom of pool feel slippery. When the generator company rep came out, he informed us we have a high level of phosphates in our pool. We weren't aware we were to check for phosphates. The pool store that checks our water does not check for phosphates either. We later found out the store will check for phosphates if requested. Anyway, the rep told us to use the phosphate treatment program he provided and this should correct our problem with phosphates, chlorine and mustard algae and then our pool should maintain adequate levels of chlorine that are produced by the generator. We treated with the phosphate treatment and after re-testing, we still had a high level of phosphates. We did a second treatment and just re-tested yesterday and the phosphate level is still at 500 ppb. I am losing hope with pool maintenance. We got the salt generator so we wouldn't have to continually have to add chlorine, but we still have to add chlorine. We treated for phosphates, but it isn't going away. Our pool has mustard algae. The bottom is slimy. Any suggestions? The fact that you have mustard algae and slime on the walls, implies that the demand for chlorine is very high. Under these circumstances, it appears that your salt chlorine generator is not able to produce enough chlorine to maintain a proper Free Chlorine level. It is a matter of playing catch up. The phosphates are not helping the situation either: they act as a fertilizer and promote algae growth. 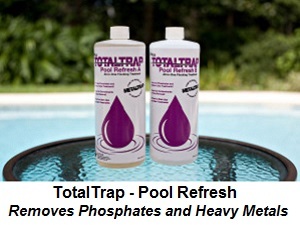 Adding a phosphate eliminator, such as POOL REFRESH, was a good thought. However, 500 PPB may still be too much. To be effective you must lower the level closer to zero. Once you level the playing field and get rid of this backlog of algae and slime, it should be easier for the salt chlorine generator to keep up with the chlorine requirements of the pool. Step one should be to treat again for phosphates. Step two, should be to add sufficient chlorine to boost the Free Chlorine level to 5-10 PPM and keep it there long enough to destroy the algae and slime. It may take a lot of chlorine to do this and the longer it drags out the more chlorine will be required. As long as it is not dead, it will continue to grow. Step three should be to add a treatment for mustard algae. You can use either a copper algaecide or a sodium bromide product. Both seem effective. Check with the salt chlorine generator dealer, as to their preferences for a mustard algae treatment. For a salt chlorine generator to function properly, the salt level must be maintained with specified ranges. A Salt PockeTester can be used to test the salt level. It is easy to use and covers the broadest range needed. I hope that this information will prove helpful. Good luck. ► Is It Mustard Pool Algae? Alan, I have been told that I have mustard algae. I first discovered it back in Dec. of last year. The pool was installed in Oct. of the same year. It is a 27 foot round above ground pool. Before I was told that It was mustard algae, I would vacuum it up through the filter. I did this several times before I was told to vacuum on waste. Its looks like sand on the bottom of the pool, but acts like a real fine powder when the vacuum gets close to it. If I don't run the pump, then there isn't much on the bottom of the pool. But when I turn the pump on it really shows up. I have treated it with a bottle of Yellow product and some copper algaecides. I also shocked the hell out of it with chlorine. I have taken everything out of the pool (including the steps) and it still comes back. I still have it and don't know what to do. Help. I have read all your letters concerning mustard algae and pretty much have tried everything you suggested. Help. Thanks. If you really have mustard algae it should respond. Make sure the following is done. Boost the FREE CHLORINE reading to 10 PPM an d keep it there until the problem is solved. Make sure that you are testing for FREE CHLORINE! Keep the filter operating continuously, until the problem is solved. Try and direct the water flow into the most affected areas. Add a dose of a Yellow Sodium Bromide product. Use the pool vacuum and brush to clean the corners and pool bottom perimeter. Drop the pH to 7.2. This will help increase the effectiveness of the chlorine. This treatment should be effective, if what you have is mustard algae. Let me know how things turn out. BETTER CIRCULATION CAN HELP SOLVE AND PREVENT THIS TYPE OF PROBLEM. The Pool Circulator is a most effective way to achieve better circulation and chemical distribution. Good luck and I hope that this information will prove helpful. ► What Kind Of Algae Is It? After reading a lot of the problems people are having with mustard algae, I'm not so sure if the algae I have is mustard algae. My algae looks nothing like sand. I called my local dealer and described the algae as a green or a late green substance that seems to look puffy and is very easy to vacuum up. The dealer informed me that I have mustard algae and that I should treat it with a mustard algae product. The algae in my pool does not look anything like sand, that's for sure. If I approach it to quickly with the vacuum cleaner head it will explode only to settle later. How does one determine what kind of algae they are battling? Mustard algae is simply a non-scientific term for variations of the common blue-green algae. It is less important to identify the algae than it is to eliminate the problem. The fact that it is "powdery" is good enough for me. Boost the FREE CHLORINE level to 10 PPM and keep it elevated, until there is improvement. Add either an initial dose of a chelated copper algaecide or a dose of a 60% polymer algaecide. To avoid a recurrence make sure that you test for FREE CHLORINE and maintain it within the 1-3 PPM range. Use a reliable tester, such as the ColorQ PRO 7, which eliminates all color-matching and guesswork. Try and maintain good circulation, as lack of proper circulation aids the growth of algae. Replacing your existing return jet fittings, with The Circulator, will dramatically improve circulation, by creating a spiraling return flow, that reaches throughout the pool. The addition of a Robotic Pool Cleaner can help greatly in improving bottom circulation and eliminating algae-prone dead-zones.. Good luck and I hope that I have been helpful. ► Mustard Algae Not Green Algae? A week or so ago, you helped me identify a pool water problem that I had been fighting for several months. You advised me that I should be killing "mustard algae" (not the green algae that I thought was my problem and so did several local "experts"). Thanks to your expertise and following your instructions, I now have a clear, algae free pool. You were absolutely correct, my problem was mustard algae NOT green algae. You deserve more than just a thank you, but that is about all I can pass along to you. Thank you. Thanks for the follow-up. Glad to hear that everything cleared up. Yellow mustard algae can be a tough one, especially, if you are not familiar with the problem. So don't be too tough on the "locals." Enjoy the summer. Lately, my pool has developed a powdery stuff that is yellowish and looks like pollen. Only thing is I don't have any trees or plants near the pool. Could this be algae? My pool is a 15' X 30" X 4' above ground pool. What should I do? What you are describing could be mustard algae. The problem can be treated easily enough and with some maintenance shouldn't return. Brush all the walls and the bottom and keep the filter operating continuously, until the problem is eliminated. Add a quick acting shock: liquid chlorine, calcium hypochlorite, sodium dichlor or non-chlorine shock, at the rate of 2 pounds per 5000 gallons of water. After a few hours test for Free Chlorine: make sure that you are using a Free Chlorine Test Kit! Repeat the additions, at the rate of 1 pound per 5000 gallons, until you are able to maintain a Free Chlorine level of at least 1-3 PPM, for an overnight period. At this point all the algae should have been destroyed and normal chlorination can be resumed. If the water is cloudy, add a dose of a "Blue" Clarifier. A Nano-Stick Clarifier can be more effective than a standard clarifier and can last up to six months. Safe with all types of chemicals and filters. Copper very effective in controlling mustard algae. I suggest adding a dual-ion, solar-powered pool mineralizer, that adds copper and zinc ions. These steps should help keep your above ground pool algae free, but you must maintain a proper chlorine level to keep it that way! I hope that I have been of assistance. Enjoy the summer. ► Mustard Algae Pool Problems? How's it going. I've been in the commercial pool industry for almost four years now and this year by far has been the worst hit with a lot of companies here in Atlanta with the Mustard Algae problem. We deal with problems obviously all the time and would like to think we know how to deal with all of them or at least know someone that can. Mustard Algae remains a problem. Yeah, now we are using a new product that specifically treats the Mustard Algae, and proper water chemistry has always been maintained throughout. My question is where is this form of Algae originating and can it be totally wiped out or is it an ongoing battle. It obviously becomes an expense issue over and above set budgets. But also it's time consuming with the cleanup and generally a pain in the proverbial, if you don't mind me saying. Any insight towards the subject would be appreciated. By using the yellow treatment every time a pool is shocked, can that do any harm even if no algae is present. Thanks for you time Alan, very interesting website. Mustard algae is a variety of the common green algae and is present in the environment. The problem begins, when it becomes resistant to the normal levels of chlorine. There are two popular yellow treatments: one based on sodium bromide and the other based on ammonium sulfate. Both seem to work, although in different ways. The sodium bromide product does have a residual action - the generation of bromine. The ammonium sulfate product has no continuing effect, once the treatment has been completed. No harm can be done to the pool or person, if little or no algae is present. If the pool is vinyl, serious thought should be given to using a chelated copper algaecide. It is not popular in your neck of the woods, but it is very popular across the country. The use of a robotic pool cleaner can help deal with the conditions that can lead to mustard algae problems. Improving circulation and acting as a micro-filter are some important advantages of this type of pool cleaning product. The addition of The Pool Circulator can help improve circulation and chemical distribution and eliminate dead zones. I hope that I have been helpful. ► Mustard Algae And No Chlorine Level? Your site is very helpful, thank you so much. I have a question regarding mustard algae. I treated the pool with 4 lbs. of Yellow Out and 4 lbs. of shock. It did not clear so I added another 4 lbs of chlorine 8 hours later and another 4 lbs. 8 hours after that. The pool is not holding the chlorine and the water is still cloudy green. I haven't vacuumed yet or cleaned the filter. Should I try these two steps or do I have to wait until the pool is clear. The algae has diminished significantly although traces of it does keep reappearing on the steps. I am brushing throughout the process. Thank you. The "Yellow" ammonium sulfate products work by converting chlorine into chloramines, a form of combined chlorine. It is not what I usually recommend, but it can work. The problem. now, is that you need to add lots of chlorine - 10 PPM for each 1 PPM of chloramines - i n order to destroy the chloramines and decompose the algae. Once you get a stable free chlorine level, the mustard algae should be eliminated. I suggest that you add the liquid chlorine or quick dissolving shock, about 2 pounds/gallons per 5,000 gallons, until the free chlorine level is over 5 PPM. Don't drag it out! The longer it takes, the more product will be required. Keep it there until the problem is under control. Check the overall water chemistry as well. Have the water tested for phosphates and nitrates, as their presence could promote algae growth and increase chlorine usage. If phosphates are present, you can remove the phosphates, by treating the water with Pool Refresh, which is a 2-part system, that allows you to filter or vacuum the phosphates out of the pool water. Make sure that you are testing for FREE CHLORINE. A product, such as the ColorQ all-digital water analyzer, provides the right kind of information and is ideal for this purpose. Adding a periodic dose of a copper algaecide might help prevent a recurrence. Otherwise, if it returns try adding a 60% polymer algaecide. Poor circulation can make algae growth more likely. You might consider adding THE POOL CIRCULATOR. The easy to install device will eliminate the dead spots, that can promote algae growth, by creating a spiraling return flow, that reaches throughout the pool. Better circulation cures a lot of problems. I hope that I have been helpful. I have a 27' round above-ground pool. I CANNOT seem to get rid of the mustard algae problem I have. I had my water tested, and the metals were extremely high (due to well water being combined with city water when it was originally filled 2 years ago). To bring these levels down to normal, I had to add a total of 5 bottles of metal treatment over a one week period. The pool company suggested taking care of this problem first. I have had this algae problem since the pool was first set up, but have always had good chlorine readings. Now, I have NO chlorine. I have used a sodium bromide, with up to 5 lbs of shock (on 3 occasions), and still have the algae, and no chlorine. I have a brand new cartridge filter. I brush and vacuum all the time. All this time my water has always been crystal clear. I use a chlorine floater with 3" slow tabs, AND add the one a day fast dissolve tabs daily. Is there another way to get my chlorine back? Did the metal treatment take it away? I am in need of serious help with this continuing problem. Thank you. Adding the metal treatment was the right thing to do. Controlling the metals should come first. The metal treatment did not inter fere with your chlorine reading. I would not suggest that you use a copper algaecide to treat the mustard algae. You have enough of a metals problem and the metal treatment could interfere with the copper algaecide. If the source water contains iron and other metals, you can avoid adding to the problem, when new water is added. Simply attach a METALTRAP Filter to the garden hose and it will remove metals, as water is being added to the pool. The sodium bromide product that you added should help control and eliminate the mustard algae, BUT, only if you maintain a suitably high level of chlorine. Not having any chlorine is indicative of the fact that the chlorine being added is converting to bromine, by oxidizing the sodium bromide. In turn, the bromide gets destroyed, by the Sun's UV rays, so the level always appears low. I suggest that you add some liquid chlorine, after the Sun goes down, as that will allow the bromine generated to last through the night and into the early part of the next day. You might also consider using a 60% polymer algaecide, as it is not copper-based and will provide some backup sanitation, throughout the day. I hope that this information will prove helpful. Good luck and enjoy the pool season. I have a question. We had a small problem with mustard algae. We went to our pool supply and brought a water sample and they sent us home with some copper algaecide. Now our less than 1 year old pool has a blue something all over the bottom and stairs. We went back and they gave us a mineral remover. I don't know what to do now. Help. The "blue" something could be copper. If the copper algaecide was a chelated copper formulation, it would be unusual to cause staining, unless the pool water chemistry was far from optimum. The product that you added is used to help control heavy metal staining. I doubt that it will remove the stains just by the simple addition of the product to the pool water. It will probably be necessary for you to drop the pH of the water to approximately 7.0 and add MetalTrap Stain Remover. After the stains are removed, follow with the addition of Pool Refresh, which will allow you to filter or vacuum the stain-causing metals out of the pool. Lastly, add a dose of Liquid MetalTrap, to scavenge up ant lingering traces. All 3 MetalTrap products are contained in the MetalTrap Stain Reversal Kit, which should be used, as directed. There are other means of controlling mustard algae that do not involve a copper algaecide. Judging from your experience, you might want to try a 60% polymer algaecide, which contains no metals. Better circulation will surely help and you can easily and dramatically boost circulation. By installing The Circulator, in place of the standard return jet fittings, you create a spiraling return flow, that reaches throughout the pool. I hope that this information will prove helpful. I have a recurring problem with mustard algae. I have followed some of the recommendations that you have provided under the yellow mustard algae topic. The problem does seem to be under control. My question is, do you think that an automatic pool vacuum will make a difference? The pool is a 16' x 32' inground pool. Thanks for the help. It certainly won't hurt. A robotic pool cleaner will help improve water circulation across the bottom and all of the nooks and crannies. And that's where algae tends to gain a foothold. In addition, mustard algae tends to be powdery and the pool cleaner should help remove it from the underwater surfaces. Did I mention that it will save time and effort? Good luck with your decision. I think that I have a greenish mustard algae. It can be vacuumed and brushed quite easily. Shocking the pool does seem to help. The problem is that it comes back again and again. My pool is an 18 X 36 foot vinyl lined pool. What products are best to use so that I can avoid this problem? Thanks. Mustard algae can be treated in two effective ways and, in your vinyl pool, both are good. Chelated Copper Algaecides are usually effective, in controlling this type of algae. The chelated types of copper algaecide will require additions every week or two and this will certainly help, in your case. Your sanitizer level, chlorine I assume, is probably not being maintained adequately at all times. Make sure that you maintain a 1 -3 PPM level of Free Chlorine, at all times. Do this and it is unlikely that you will see the mustard algae problem returning, with any regularity. If you don't have an automatic pool cleaner, consider adding one. These cleaners are quite affordable and are very effective at cleaning and improving the water circulation on the bottom. In the case of your above ground pool, it can act as a main drain, while operating. Another effective treatment for mustard algae is the use of a 60% polymer algaecide. When shocking a pool make sure that you add enough product and it is added frequently enough to boost the Free Chlorine level to 5-10 PPM. Make sure that the pH is 7.2-7.6. Try to maintain at least 1-3 PPM, through the overnight period. Keep the filter operating continuously, until the problem is controlled. Once the problem is controlled resume normal chlorination and filtration. Poor circulation creates dead zones that promote algae growth. Better circulation assures better distribution of the sanitizing chemicals and makes algae problems less likely. The Pool Circulator is an easy-to-install device that will dramatically improve circulation and eliminate any dead spots. Going forward, I suggest switching to a salt chlorine generator. It provides better results and provide more control, while eliminating the negative effects of chlorine use. I hope that this information will prove helpful. In treating mustard algae, is it also recommended to treat pool toys, floats, vacuum, even bathing suits? I've been told many different opinions and don't want to have the mustard return. Treating the pool accessories certainly can't hurt. But, by itself it will not prevent a return of the problem. The pool water and conditions must be maintained so that it is unfavorable to mustard algae growth. Pay attention to the Free Chlorine levels and the water filtration and circulation. Stagnant water will cause problems. Redirect the return flow into any area that seems to be prone to the problem. I hope that I have been helpful. ► Yellow Algae Stain or Metals Stain? Alan, I have an inground pool with a volume of 15000 gallons. I have treated what I believe to be a yellow algae problem with twice, along with the recommended steps necessary for this yellow product to work. The algae still exists on the side of my pool and does not scrub off with even a brush. Is there something else that I can use to get rid of this problem? You didn't say if the product was helpful. Yellow mustard algae brushes very easily. Either it is another type of algae or it is a mineral stain, possibly iron. Try this. Put 1/2 pound of pH reducer powder in a white sock, tie on a rope and hang over the side of the pool against the stained area. Check after fifteen minutes. If there is improvement, it is definitely a metal stain. To treat the stain, I suggest that you use a MetalTrap Stain Reversal Kit, which contains everything required to dissolve the stains, eliminate the metals from the water and help prevent a recurrence. If the sock treatment did not work, I suggest that you try using a 60% polymer algaecide. Boost the Free Chlorine reading to 10 PPM and use the scrub brush. Redirect the returns to send more water towards the affected areas. BETTER CIRCULATION CAN HELP SOLVE AND PREVENT THIS TYPE OF PROBLEM. The Pool Circulator is a most effective way to achieve better circulation and chemical distribution. I hope that this will prove helpful. ► Mustard Algae And Biguanide? Alan, I have a 24 foot above ground pool that is 3 years old and I am constantly fighting what I am told is a mustard algae. It appears as a yellowish color that almost looks like sand laying on the bottom and I also get it on the sides and behind the ladder. I use biguanide instead of chlorine because of my wife's skin allergies so switching to chlorine is not really an option, but I can't seem to get rid of this problem. Do you have any suggestions? I have had the water tested and the levels all look good and I use the premium algaecide. Thanks. You may have a problem! I know that is not what you wanted to hear, but the best products for use against mustard algae cannot be used in a biguanide pool. So unless your dealer comes up with a proven recommendation, I think that you will have to switch to chlorine at least temporarily. In fact, you should re-evaluate the situation and decide if you really want to stay with biguanide. Based on the emails I receive, you will have to switch, sooner or later, and now seems lie the right time. Before trying chlorine, you might try adding a polymer algaecide. This material will register on the test kit, as biguanide. Make sure that the biguanide is raised to 50 PPM, before adding. Retest, after adding the algaecide. This increase is due to the algaecide and should be considered, when retesting over the next month or so. If this fails, you should consider switching, away from biguanide. Using salt chlorine generator would be the best way to utilize chlorine. It will provide better results and more treatment options. The switch will become inevitable, so I would not continue to throw money after the problem, by trying to stay with biguanide. Good luck.